The misapplication of the Darwinian biological theory known as social Darwinism has been intensively discussed in another context (Mühlmann 1968; Zmarzlik 1969; Altner 1981a, b; Müller-Hill 1988; Hofstadter 1995; Hawkins 1997; Dickens 2000; Junker 2004; Hoßfeld 2005b). It is well known that this biological ideology became highly influential after the World War I and especially during the period of National Socialism in Germany. That paleoanthropology was no free zone of research stems from different reasons: first, because paleoanthropology was a subject of the highly politically involved anthropology; second, because racial thinking and racist theory were interwoven with all aspects of daily life (Bowler 1976; Stepan 1982; Bowler 1986, 1988, 1996, 1997, 2001; Vogel 2001). The following three symptomatic cases are discussed to exemplify pars pro toto and exemplarily the impact of fascistic ideology on paleoanthropology during the "Third Reich'' in Germany. First, that archeological and paleoanthropological research was not spared by the ideology of the national socialists is documented, e.g., by the fact that the Neandertal-Museum, which had been inaugurated on May 1, 1937, was closed by order of the Reichsleiter fur Vorgeschichte, Reinertz, on March 3, 1938. The arguments were that the Museum, which should demonstrate "... Deutsche Urgeschichte, soweit sie mit dem Neandertal in engster Beziehung steht,'' did not fulfil the evaluation of an NS-commission (Beckmann 1987). Second, even more inimical to the development of paleoanthropology during the Nazi era was the fact that the most outstanding German paleoanthro-pologist at that time, Franz Weidenreich (1873-1948), lost his venia legendi at the Johann Wolfgang Goethe University due to the persecution of the Jewish population. His emigration to the USA was an irreplaceable loss for anthropology in Germany. Since he was involved in research on the largest H. erectus sample from a single locality, Zhoukoudian, paleoanthropology in Germany lost a vital contact with the international scientific community. Thanks to Weidenreich (1943), there are brilliant documentations, casts, and descriptions of the "Sinanthropus''— skulls which were lost during an attempt to ship them to the USA (Shapiro 1974), and—equally important—he is viewed as the founder of the "multiregional theory of human evolution'' (Wolpoff and Caspari 1997; Wolpoff 1999). Third, it must be mentioned that during World War II, the first edition of Gerhard Heberer's compendium "Die Evolution der Organismen'' appeared (Heberer 1943). The anthropogenetical contributions deal with comparative anatomy (v. Krogh), paleontology (Gieseler), ethology, and archeology (Weinert). In the view of the scientific historians Hoßfeld and Junker (2003) and Hoßfeld (2005b), the chapter authored by Otto Reche is the only one that takes the model of synthetic Darwinism into account. There is full agreement with the following overall assessment: ".. .[es] handelt sich über weite Strecken um vergleichende Untersuchungen zur Stammesgeschichte der Menschheit, wie sie bereits im 19. Jahrhundert angestellt wurden, erganzt durch neuere Daten aus Serologie und Palaontologie'' (Hoßfeld and Junker 2003 p 107). The biological impact on paleoanthropology was minor, as long as in practice fossil discoveries came into the literature through collaboration between the archeologists who excavated them and the anatomists who described them. 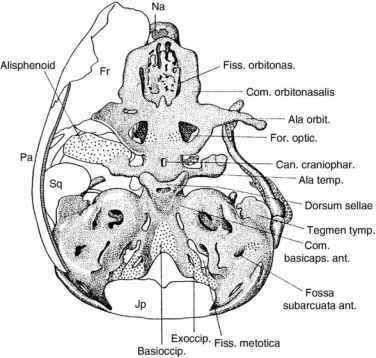 Foley (2001 p 6) states: "Archeologists and professors of anatomy seldom made a rich cocktail of Darwinian theory.'' In general, the descriptive casuistic and more or less narrative approaches in paleoanthropology hold true for the period under discussion and for early postwar times, in Germany as well as in other countries (Tattersall 2000a; Foley 2001). 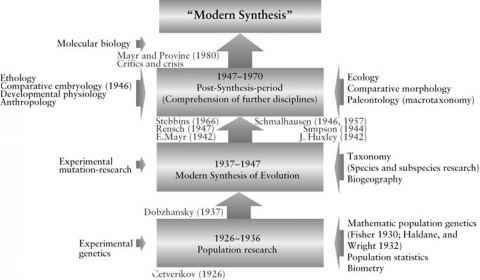 The period leading up to World War II had seen the emergence of the evolutionary synthesis, but not until the 1950s did the innovative biological principles and methods begin to inform the paleoanthropological science too (Delisle 1995; Hoßfeld 1997, 2005b; Jahn 2000; Tattersall 2000a; Foley 2001; Corbey and Roebroeks 2001b; Hoßfeld and Junker 2003; Junker 2004) (© Figure 1.6). internal evidence or individual personalities alone.'' As Dennell demonstrated very convincingly, there are strong correlations of the shift of paleoanthropological interest from Asia to Africa, first with the transition from colonialism to independence in both Asia and Africa, second with the replacement of Europe by the USA as the dominant influence in paleoanthropology, and finally with the change from paleoanthropological narration to theory-guided analysis and explanation of behavioral changes and adaptations in the past.